Is It Too Late For Restorative Dental Care Near Crofton? 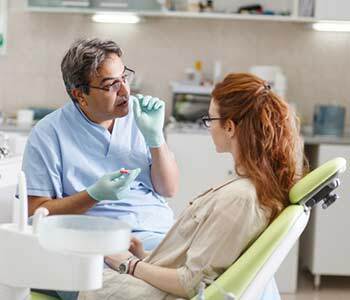 If your teeth are stained, have a few cavities, or a minor chip, then you are probably confident that a Crofton area dentist can repair the damage. However, patients with severe dental problems often hesitate, wondering if their smiles are beyond repair. Don’t worry, great oral health and picture-perfect pearly whites are never beyond reach, thanks to a broad range of premier restorative options at Bingham-Lester Dentistry in Gambrills, MD. Can your teeth be saved? We can’t answer that until you’ve had an examination and consulted with Dr. Bingham-Lester. It depends on several factors, including the extent and nature of damage, as well as the stability of underlying structures. Very often, teeth that are damaged by traumatic injury or decay can be restored. They might need root canal therapy to remove infection, followed by a dental crown to restore aesthetics and functionality. In these scenarios, the damage began with the crown, which is the visible part of a tooth. If the root and bone remain strong and relatively healthy, there is a good chance the tooth can be restored. However, patients with advanced periodontal disease are likely to have damage to the root, bone, and supporting ligaments. If the tooth is too loose, extraction might be necessary. Every patient is unique, as is every smile. We will work with you, designing a personalized treatment plan to achieve optimal oral health, and help you enjoy the confidence of a beautiful smile. Are you ready to start the journey toward great oral health and a dazzling smile? Just call Bingham-Lester Dentistry at 410-885-6522 and schedule a consultation to get started. Anonymous "Love my new dentist and her staff. Very efficient, professional, and informative. She has a lab so I could get a new crown all in one visit. I can't ask for more. Definitely recommend Dr. Bingham-Lester." Copyright © 2019 Bingham - Lester Dentistry. All Rights Reserved.